For a very long time, Gibson and his colleagues kept coming back for this Belacan (shrimp paste) Chicken set lunch that only costs RM6, which comes with deep fried Belacan chickens, steam rice, a bowl of soup, a fried bull-eyes egg and curry fish gravy. 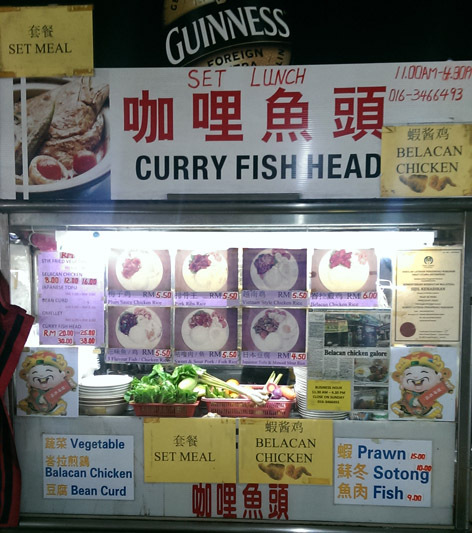 This stall is located at Pinang Delicious Food Court, Macalister Road, where you will spot a Curry Fish Head signboard at the stall. For a plate of RM6, you really get all you need for a satisfactory lunch, way better than getting “slaughtered” by those economy rice’s hawkers. However, most of the time it is a one man show for this stall, so if you were to come during peak hours especially during lunch time, be prepared to wait a while and don’t expect the owner to give you a smiley face, because he is rushing to serve all his hungry customers. You might think that since the name of the stall is Curry Fish Head, this dish must be his signature dish. There is no doubt the fish curry is superb, but not the fish head, the one Gibson got was not very fresh, but not too bad, it is just that he does not recommend it. So when Gibson ordered the fish head, he was wondering as to why the owner asked at least 3 times to confirm the order. Therefore, if you are keen for the fish curry, just stick to the fish meat but not head. There are about 9 set lunches for you to choose; the following are a few you can choose from. Address: 105, Macalister Road, 10150, Georgetown, Penang.